Volcano Stromboli is one of the most active volcanos on earth. Nonstop gas explosions throw lava over the crater rim. Big eruptions are seldom. The volcano island rises 3000m above the Thyrrenian Sea. 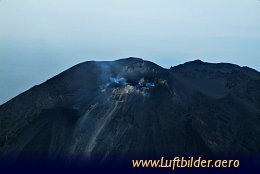 Despite the constant volcanic activities the Stromboli island is populated.